Immediately following his bestselling debut novel The Kite Runner, Afghan author Khaled Hosseini published a second novel in 2007 entitled A Thousand Splendid Suns. A Thousand Splendid Suns research paper due and don’t know how to start it? How about like this? Immediately following his bestselling debut novel The Kite Runner in 2003, Afghan author Khaled Hosseini published a second novel in 2007 entitled A Thousand Splendid Suns. Much like The Kite Runner, A Thousand Splendid Suns follows the lives of two young Afghanis during the tumultuous time period in Afghan history that saw the Soviet invasion and the ultimate rise of the Taliban to power. Unlike The Kite Runner, A Thousand Splendid Suns focuses on the lives of two young women rather than on those of two young men. The story’s two main protagonists are Mariam and Laila, two girls who are living in a shanty town outside Kabul when the city is bombed as part of the Russian invasion. Laila’s family is killed during the attack, while Mariam’s mother has committed suicide prior to the attack. Both girls eventually marry Rasheed, a much older shoemaker who owns a shop in Kabul. Rasheed immediately becomes abusive to the two women, and they plot to run away from him. At the conclusion of the story, Mariam rescues Laila from being beaten to death by Rasheed by killing him with a shovel. The murder results in a harsh execution by the Taliban but provides the diversion necessary for Laila and her children to escape. 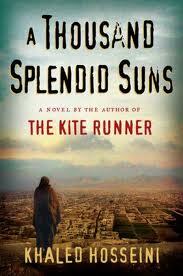 A Thousand Splendid Suns has received numerous favorable reviews, and, like The Kite Runner, it is currently being converted to a screenplay for a cinematic production to be produced by Columbia Pictures. Islam Research Papers on how Islam is viewed in the Modern world. Order a research paper on Islam from Paper Masters. Paper Masters writes custom research papers on A Thousand Splendid Suns and discuss Khaled Hosseini's second novel that follows the lives of two young Afghanis during a tumultuous time period in Afghan history.